Domenico Fetti was in Rome in 1606 when the Veil of Veronica, one of the oldest and most venerated relics in Christendom, was installed in the crossing of St. Peter's Basilica. According to medieval legend, the veil belonged to a woman who took pity on Christ as he toiled with his burden of the cross to Golgotha. She gave Christ her kerchief to wipe his brow, and when he returned the cloth, his image miraculously had been impressed upon it. This kerchief was believed to have been preserved as the relic called the "true image" or, in Latin, vera icon . In time, these words combined to form "Veronica," the name given by legend to the compassionate woman at Golgotha. Fetti's depiction of the relic is compellingly realistic. Isolated against a dark background and draped over a bar, the fabric's texture, folds, and fringed border are rendered with painstaking care. Hovering on its surface is Christ's visage -- the flesh solidly modeled and tangible. Fetti's amazingly true image of the "true image" is, in a sense, a metaphor of the task of the painter. This is not merely a brilliant and self-conscious exhibition of the painter's skill, however, but a sensitive and deeply felt portrayal of Christ at the moment of his most intense physical and spiritual suffering. Ferdinando Gonzaga, 6th duke of Mantua [1587-1626], by 1627; by inheritance to Ferdinando Carlo Gonzaga, 10th and last duke of Mantua [1650-1708], in Mantua 1706, and Venice 1709; Pierre Crozat [1665-1740], Paris, by 1728; by inheritance to his nephews, Louis-François Crozat, marquis du Châtel [1691-1750], Paris, and Joseph Antoine Crozat, baron de Tugny [1696-1751]; (Crozat collection sale, Paris, 15 June 1751, no. 119); Charles Cressent [1685-1768]. Possibly Adolphe Thiers [1797-1877], Paris. (Ehrich Gallery, New York), in 1925. Arthur L. Nicholson, Bournemouth, in 1935. (Paul Drey, New York); purchased 1943 by the Samuel H. Kress Foundation, New York; gift 1952 to NGA. The 1627 inventory has been most recently published in Lettere e altri documenti intorno alla storia della pittura. Raccolte di quadri a Mantova nel sei-settecento (Fonti per la storia della pittura 4), Monzambano, 1976: 25. The relevant entry reads "il sudario di Nostro Signore di mano del Sig. Perfetti." As Pamela Askew has suggested, this is most likely a mistranscription of "per (mano di) Fetti" and not a reference to the "prefetto delle fabbriche," Anton Maria Viani (letter of 14 October 1990, NGA curatorial files). Eduard Safarik, Fetti, Milan, 1990: 241, also admits this possibility. For the painting's inclusion in the 1706 Mantua inventory and the posthumous 1709 Venice inventory, see the reference cited in note 1, Lettere e altri documenti 1976: 51, 60, as well as Martin Eidelberg and Eliot W. Rowlands, "The Dispersal of the Last Duke of Mantua's Paintings," Gazette des Beaux-Arts 6 pér., 123 (1994): 217-218, 269, fig. 10. Following the fall of Mantua to imperial troops in 1707, Ferdinando Carlo went into exile first in Venice and later in Padua, where he died intestate. While the Venetian courts attempted to determine Ferdinando Carlo's legal heir, his art collection was exhibited in one of his Venetian properties, the Palazzo Michiel dalle Colonne. Those works not confiscated by disgruntled heirs during transport to Venice or ceded to the declared heir, Charles of Lorraine, were sold on the Venetian art market, as recounted by Frances Vivian, Il Console Smith, Mercante e collezionista, Vicenza, 1971: 8-9. Crozat seems to have purchased most of his paintings by 1726 and is listed as the owner on the engraving by Charles Simonneau (1645-1728) in the Recueil d'Estampes d'après les plus beaux tableaux et les plus beaux dessins qui sont en France, 2 vols., Paris, 1729-1742: 2:106. On Crozat's collection see Margaret Stuffmann, "Les Tableaux de la collection de Pierre Crozat. Historique et destinée d'un ensemble célèbre établis en partant d'un inventaire après décès inédit (1740)", Gazette des Beaux Arts 6 pér., 72 (1968): 29-32. The Veil of Veronica is no. 113 in Crozat's posthumous inventory (1740), quoted in Stuffmann 1968, 67-68, no. 89. The sale was organized by the surviving brother, Louis-Antoine Crozat, baron de Thiers [1699-1770]. In the Catalogue des tableaux et sculptures...du Cabinet de M. le Président de Tugny e celui de M. Crozat, prepared by Mariette, the painting is listed in the group of works owned by "M. Crozat," and not in the group owned by Joseph Antoine Crozat, baron de Tugny, as is often erroneously stated. Stuffmann 1968, 33-35, has demonstrated that the "M. Crozat" in question is in fact Louis-François and not Pierre. Pierre Crozat's will stipulated that if Louis-François were to die without issue, the inheritance should pass to Louis-Antoine Crozat, baron de Thiers; however, marginalia in the NGA microfiche copy of the 1751 catalogue give Louis-Antoine as the purchaser, and thus not the owner, of several paintings. Stuffmann lists Cressent as the purchaser, presumably on the basis of an annotated copy of Mariette's sale catalogue. The painting does not appear in the sales or inventories of Charles Cressent published by Marie-Juliette Ballot, "Charles Cressent, sculpteur, ébéniste, collectionneur," Archives de l'art Français, ser. 4,10 (entire issue, 1919). According to the catalogue of the 1925 exhibition at Ehrich Gallery that included the painting. However, the Veil does not appear in Charles Blanc's catalogue of Thiers' collection, which was given in toto to the Louvre by his sister-in-law (Blanc 1884). 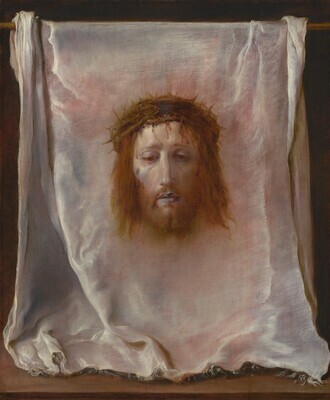 Although Thiers' collection consisted mainly of casts, copies, and porcelain, it did include a few paintings, making it possible that he owned Fetti's Veil of Veronica at some point, but sold it before his death. However, it is also possible that the Ehrich Gallery catalogue simply confused Crozat's nephew, the baron de Thiers, with the later collector because of the similarity in name. The painting is described as attributed to Velázquez in the 1925 exhibition catalogue, a puzzling statement as the catalogue lists the Simonneau engraving, which identifies Fetti as the painter. Lent by Nicholson to 65th Church Congress Exhibition, Bournemouth, England, 1935, no. 106. Exhibition of Paintings by Velasquez and Murillo Never Before Shown in this Country, Ehrich Galleries, New York, 1925, as Attributed to Velasquez. 65th Church Congress Exhibition, Bournemouth, England, 1935, no 105. Recent Additions to the Kress Collection, National Gallery of Art, Washington, D.C., 1946, no. 797. The Age of the Marvelous, Hood Museum of Art, Dartmouth College, Hanover, New Hampshire; North Carolina Mus. of Art, Raleigh; Mus. of Fine Arts, Houston; High Mus. of Art, Atlanta, 1991-1992, no. 212, color pl. 15 (shown only in Hanover and Raleigh). The support is a two-member panel, probably poplar, with a vertical join just left of center. The ground is a smooth white layer under a warm, pale red imprimatura that shows through in thinly painted areas. The paint was applied thinly and opaquely, often with a small feathered brushstroke. A larger brush was used for the drapery folds, but without creating impasto. Wood strips on all four sides were added in 1944 when the panel was marouflaged and cradled. The paint surface is abraded, especially in the shadows of the face and hair. Areas of discolored inpainting are visible here as well as in the shadows of the cloth folds and along the panel join. The varnish is discolored and the otherwise thick varnish is much thinner in the whites and flesh tones. Wood analysis was not carried out because the panel itself is completely hidden behind edge strips and a wooden backing attached prior to cradling. The apperance of the grain in x-radiographs, however, suggests an even-grained hardwook, possible poplar (populus sp.) or walnut (juglans regia). Endres-Soltmann, Mary. "Domenico Fetti." Ph.D. dissertation, Ludwig-Maximillians-Universität, Munich, 1914: 63. Paintings and Sculpture from the Kress Collection. National Gallery of Art, Washington, 1945 (reprinted 1947, 1949): 135, repro. Frankfurter, Alfred M. Supplement to the Kress Collection in the National Gallery. New York, 1946: 49, repro. Arslan, Edoardo. "Cinque disegni veneti." Arte Veneta 8 (1954): 291, n. 2. Michelini, Paola. "Domenico Fetti a Venezia." Arte Veneta 9 (1955): 129, n. 3. Paintings and Sculpture from the Samuel H. Kress Collection. National Gallery of Art, Washington, 1959: 220, repro. Sterling, Charles. "Les peintres Jean et Jacques Blanchard." Art de France I (1961): 91. Perina, Chiara. "Pittura." In Mantova. Le Arti. 3 vols. Mantua, 1965: 3:462. Summary Catalogue of European Paintings and Sculpture. National Gallery of Art, Washington, 1965: 49. Lehmann, Jürgen. "Domenico Fetti. Leben und Werk des römischen Malers." Ph.D. diss., Johann Wolfgang Goethe-Universität, Frankfurt am Main, 1967: 200, no. 56. European Paintings and Sculpture, Illustrations. National Gallery of Art, Washington, 1968: 42, repro. Fredericksen, Burton B., and Federico Zeri. Census of Pre-Nineteenth Century Italian Paintings in North American Public Collections. Cambridge, Mass., 1972: 70. Shapley, Fern Rusk. Paintings from the Samuel H. Kress Collection: Italian Schools, XVI-XVIII Century. London, 1973: 67-68, fig. 124. European Paintings: An Illustrated Summary Catalogue. National Gallery of Art, Washington, 1975: 128, repro. Chastel, André. "La Véronique." Revue de l'Art no. 40-41 (1978): fig. 15. Shapley, Fern Rusk. Catalogue of the Italian Paintings. 2 vols. National Gallery of Art, Washington, 1979: I:180-181, II:pl. 125. Walker, John. National Gallery of Art, Washington. Rev. ed. New York, 1984: 230, no. 295, color repro. European Paintings: An Illustrated Catalogue. National Gallery of Art, Washington, 1985: 152, repro. Wheeler, Marion, ed. His Face--Images of Christ in Art: Selections from the King James Version of the Bible. New York, 1988: 127, no. 86, color repro. Safarik, Eduard. Fetti. Milan, 1990: 31, 176, 241-243, repro., 294, 340. The Age of the Marvelous. Exh. cat. Hood Museum of Art, Hanover, New Hampshire; North Carolina Museum of Art, Raleigh, 1991-1992: 446, no. 212, pl. 15. National Gallery of Art, Washington. National Gallery of Art, Washington, 1992: 107, repro. Eidelberg, Martin, and Eliot W. Rowlands, "The Dispersal of the Last Duke of Mantua's Paintings," Gazette des Beaux-Arts 6e période, 123 (1994): 217-218, 269, fig. 10. De Grazia, Diane, and Eric Garberson, with Edgar Peters Bowron, Peter M. Lukehart, and Mitchell Merling. Italian Paintings of the Seventeenth and Eighteenth Centuries. The Collections of the National Gallery of Art Systematic Catalogue. Washington, D.C., 1996: 85-89, color repro. 87. Hand, John Oliver. National Gallery of Art: Master Paintings from the Collection. Washington and New York, 2004: 159, no. 120, color repro.